One day when I was watering my flowers, I started thinking about how our direct sales businesses are so similar to a garden. When you decide to plant a garden, you have to make preparations for it first. You have to choose what types of plants to purchase and how to arrange them. You have to till the ground and get it ready for planting. Then you have to plant the seeds or flowers. Once planted, you still have to water them and take care of the garden until it begins to bloom. Once it starts blooming, you have to continue to tend to your garden by watering and weeding it on a regular basis. You do not expect your garden to bloom simply by tossing a few seeds on the ground and hoping for the best. You cannot expect to plant the seeds today and have a full blooming garden tomorrow or even next week. Once your flowers are blooming you don’t stop watering or tending to them. You cannot expect your garden to keep growing and blooming on its own. It is the same with our direct sales businesses. We have to make a choice to work our businesses and choose to be successful. We have to till the ground and prepare it by creating a work schedule and doing all the daily tasks we need to do whether we feel like it or not. We have to plant lots of seeds by talking to people and sharing our business because not every seed will bloom. We have to follow up with our customers and water and tend to our businesses each and every day. We have to pull up the weeds of negativity and toss away the doubts that threaten to ruin our lovely business garden. We have to remember that our results always equal the amount of work we put into our direct sales business garden. We also cannot expect the seeds we plant to sprout right away though. We also have to learn to not be disappointed when some of the seeds do not sprout at all. Remember “some will, some won’t, someone else is waiting”. We cannot expect our direct sales businesses to bloom by haphazardly doing a few business activities or sharing our business with a few people and then just hoping for the best. I know how pitiful my flowers look when I forget to water them for a few days or when I let too much time pass before pulling up the weeds. I have seen the same thing happen with my business too. When I am not treating it like a business, not tending to my customers, following up with leads or fueling myself with training and motivation, it begins to look like a wilted, withered mess. We have to treat our businesses as a business and do the constant work in order to see constant results just like we do in our gardens. Keep planting, watering and tending to your business garden so you can enjoy the beauty of your hard work! 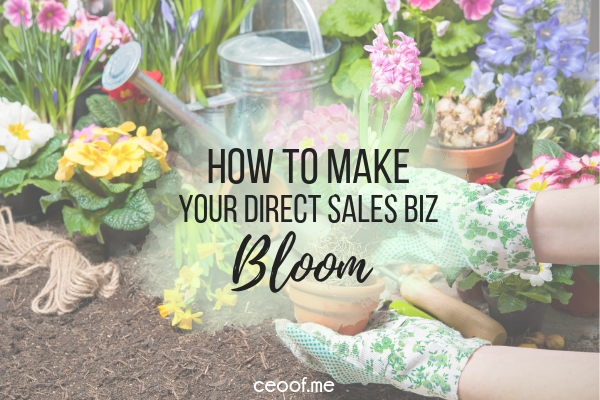 What can you do today to help your direct sales business garden bloom bigger & better? I would love it if you would leave a comment below and share this post too! Thank you! I have a question for you. Is it possble to be a direct sales rep for more than one product provided they are different items such as beauty + jewelry + bags? Hi Nina, yes it’s possible as long as any of the companies you are with do not have non-competes or rules for you to not be a rep for a similar or competing type of business. However I personally recommend finding and choosing 1 business to focus on – what you put your efforts and energy into – you will get back. If you spread yourself over several businesses you will not see as much return on your investment and your friends/customers may feel that you are promoting too many businesses and that you don’t really believe that any of your businesses offer a viable income opportunity. Great Point Misty! To be a CEO of a business takes a great deal of passion and commitment. As an Independent Founding Ruby Ribbon Stylist I am driven because I know that the garments I sell are the BEST in the shapewear market today. If I were to attempt to sell another product my Ruby Ribbon business would suffer.